I had a little time to doodle last night. It’s the calm before the storm at work. I’ve been forewarned to expect a little more overtime. Hopefully it will slow down in a day or so until after the new year. Here’s a doodle of a zipper purse I bought a few months ago. I occasionally want to carry only my wallet, keys and phone, so this is the perfect size. Most of the time, I carry a purse that will hold EVERYTHING! God forbid I should get a mile from my house without lipgloss or a Kleenex. Lovely purse doodle Sue, have you used pen and ink? Thanks for the link, I have not seen Papya designs before, they are georgous! I also have a big bag that everything goes into, though some things seem to sink to the bottom never to be seen again!! 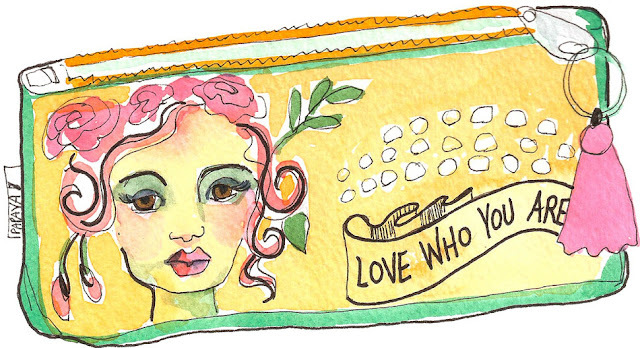 Super cute bag with a great saying - Love how you paint! such a cute piece and purse! Love this! that's a beautiful zipper purse. Thnx for the link!